As it turns out, this isn't "The One Where Ross Mugs Someone." Blackpool Police in the U.K. posted a photo on Facebook Tuesday of a suspect holding a case of beer — or is it lager? — saying they believe he's connected to a robbery at a local restaurant. Officer Gareth Vickers told NBC News that the man in the photo isn't suspected of stealing the beer but rather a coat, wallet and cellphone from someone at Mr Basrai's restaurant on Sept. 20. The still surveillance photograph was later captured at a shop. 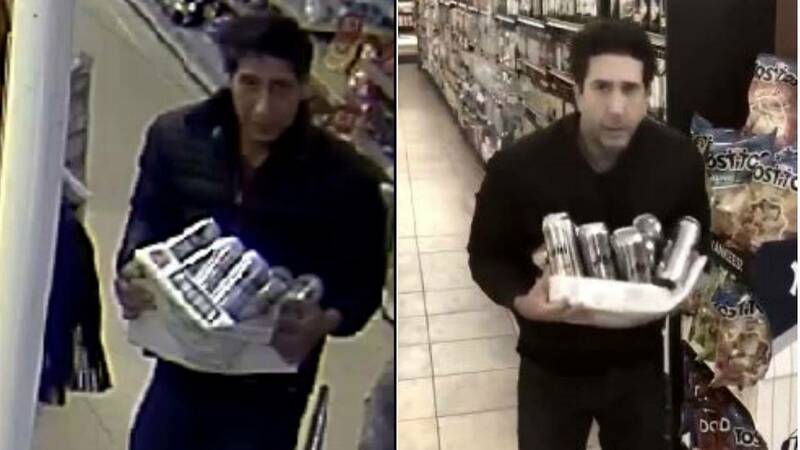 So many commenters pointed out that the suspect looked like actor David Schwimmer that the department had to clarify that they had "investigated this matter thoroughly and have confirmed that David Schwimmer was in America on this date." "We're so sorry it has to be this way," the department added. But that didn't stop people from diving deep into references from the show, which aired on NBC from 1994 to 2004. "I don't think it's been this guy's day, his week, his month or even his year," wrote one person, referring to the show's theme song. "That's clearly not Ross. They're as different as night and ... later that night," said another, referring to an episode in which Rachel dates a man who uncannily resembles Ross. "It's not ross. ... It's russ, he's trying to frame ross to win back Rachel," said someone else, referring to the same episode. And then the real die-hard fans got started. "Please approach with caution. He is known to have studied Karate and we believe he has mastered the art of Unagi, the state of total awareness," wrote one. "ROOOOSSS CAAAAN, GET ME THE BEEEERS," wrote another. "I was going to read the report for this but it was 18 pages... FRONT AND BACK! It rambled on for so long that I fell aslEEP," someone else quipped. Blackpool Police Inspector David Wilson said the outpouring of comments has actually produced some leads. "We can see the humorous side to this but equally for us, there is a policing purpose to these kinds of appeals on social media and in this case, it's to help us find the man pictured, and seek justice for the victim," Wilson said.